An Introduction to nb Sola Gratia. NB Sola Gratia hit the inland waterways of the UK on Friday 7 March 2014. At that point, she was technically still called Dawn, but we renamed her when we licensed her. She is an ex Black Prince hire boat, with one other owner in between. She is 58' long and 6'10" wide, with a large cruiser stern deck (back or blunt end), and extended bow deck (front or pointy end). Although she was fairly comfortable for the short term in her original hireboat format, we had the interior refitted during June and July to make her more suitable for our needs as Continuously Cruising Liveaboards. The name of NB "SOLA GRATIA" is from the Latin. The meaning varies very slightly depending on the context, but is either 'Only by Grace' or 'By Grace Alone'. For several years we had felt God's calling to the waterways, but we could not see how this could happen. Then a series of events changed all that and we felt God moving powerfully to put things in place. We recognised that we had done nothing to deserve anything that we had, or what God was giving to us now. We were constantly reminded that it is only by God's grace that we are saved. There is nothing we can do to earn His favour. We are still learning exactly what He wants us to do, but we are humbled, blessed and very happy to be here. However, we believe that God has given us "The Good Ship", along with a ministry to use her. We believe that at least part of this ministry is to provide a haven for people to whom we are led: People who, for whatever reason, need to rest in the tranquillity of the waterways. 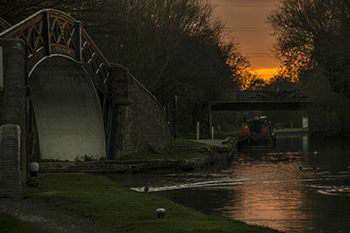 God called us to join Canal Ministries in February 2015, and we are honoured and privileged to be working with other couples who have a similar vision for sharing God's love on the Inland Waterways of Britain. In July 2015, Tim's father passed away following a fall. As a result, we remained in the Newbury area so that we could regularly pop back to Bournemouth to look after his Mum. We remained on the boat, and began to regularly attend Bridge Church. However, during January, his Mum decided that she was struggling to look after herself. We have therefore moved down to Bournemouth, and hope to get back to the boat from time to time. Our eldest daughter got married in August. This was followed by our youngest daughter announcing she was going to make us grandparents. This was not without its complications, but thankfully all has turned out well, and we have a delightful grand-daughter who is giving the entire family lots of pleasure. In August 2016, we received the shock news that Tracey's mum had passed away unexpectedly. She died peacefully in her sleep. Exactly two months later, Tim's mum died following a short illness. After dealing with all the formalities (although some are sstill ongoing), we are finally now getting back to our life on the waterways. During our time in Bournemouth, we have attended Wessex Christian Fellowship, who meet in the former Playhouse Theatre, Bournemouth Community Church, who meet in the former Moderne Cinema, and Citygate Church, who meet in a new, purpose built building opposite Bournemouth Station. We felt strongly that God was calling to Bournemouth Community Church, and this is where we settled. Now we have said goodbye to Bournemouth, and to Bridge Church Newbury, and are restarting our nomadic lifestyle, and visiting new churches across the country. We took part in the above mission this year. Raising Money for Guide Dogs. 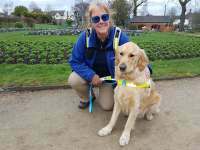 are able to name a Guide Dog Puppy "Raymond"
We finished the walk in Guide Dogs Week, 3-11 Oct 2015. So far, we have raised in excess of £8,000. We would like to make it £10,000. and do please consider supporting this worthy charity. that Tracey gave at the Crick Boat Show in May 2015. Yes, when you get serious about finding me and want it more than anything else, I’ll make sure you won’t be disappointed.” God’s Decree. “I’ll turn things around for you."